Inventory We are a resale marketplace, not a box office or venue. Ticket prices may exceed face value. This site is not owned by Gorge Amphitheatre . 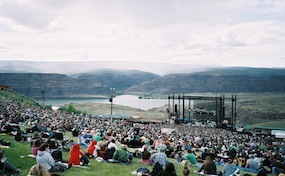 The Gorge Amphitheatre is one of the most scenic venues in the nation to catch a live performance. The Gorge Amphitheatre provides sweeping views of the Columbia gorge canyon and the Columbia River. The Gorge, as it is commonly referred, has a seating capacity of the 20,000 plus. The Gorge Amphitheatre box office operates out of the 754 Silica Road Northwest address in George, Washington. There are many Gorge Amphitheater recordings available by performers like Pearl Jam, Brooks & Dunn, and the Dave Matthews Band. Annually you can purchase Gorge Amphitheatre tickets for the Sasquatch! Music Festival, Lilith Fair, and the Vans Warped Tour. AmphitheatreGeorge.com is an independently owned and operated company that proudly provides access to a large selection and low prices online for all secondary market events. We are not currently affiliated with any primary box office or venue. Tickets can be above or below face value. To purchase tickets to all Gorge Amphitheatre events simply follow the steps online or call our operators to aid you in the buying process.